Changes to Countdown may be coming. The last two weeks on ESPN’s Monday Night Countdown, we’ve seen two very different productions. Two weeks ago, ESPN held a “tailgating” hour during Countdown at Arrowhead Stadium in Kansas City. This past Monday, ESPN didn’t have *any* set on site at Soldier Field. So, what gives? Is ESPN experimenting with different formats for Countdown going forward seeing how it affects ratings perhaps in an effort to save money down the road? An ESPN spokesperson confirmed that Countdown will be going back to the tailgating hour on November 7th for Lions-Packers and on November 20th for Falcons-Seahawks. Unsurprisingly, those are the two of the best games left on the schedule for ESPN on Monday Night Football this season, so it makes sense to treat them a bit differently. The tailgate game was received very well internally by many at ESPN (despite some technical difficulties), and there’s hope that this format will continue next season as the network continues to receive positive ratings data on the tailgate shows. On the other side of the coin, ESPN will only be holding Countdown exclusively in Bristol two more times this season, both occurring on holiday weekends – November 27th’s Texans-Ravens game, and December 25th’s Raiders-Eagles game, which will also serve as MNF’s season finale. Not sending the full Countdown crew to games also had an effect on the post-game edition of SportsCenter hosted by Scott Van Pelt, which featured a clunky interview between Van Pelt and Case Keenum, perhaps aided by a lack of on-field personnel. The SVP SC also featured Charles Woodson and Steve Young in studio to discuss the game, as opposed to on satellite from the stadium which was a subtle difference. 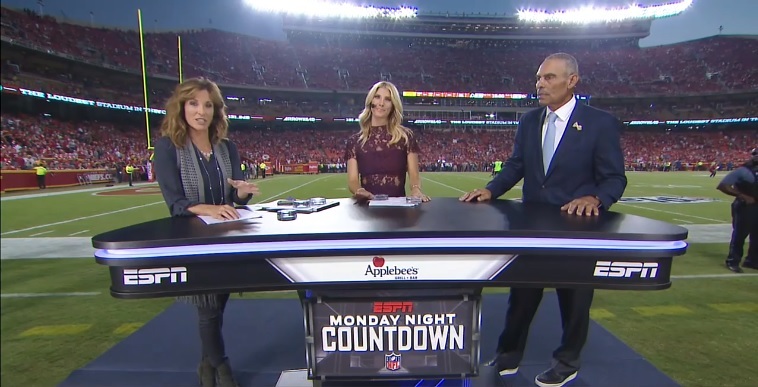 For the remaining games of the season, which numbers six weeks, Countdown will be in its usual form as it was earlier this year, with Suzy Kolber hosting at an in-stadium set and a smaller crew in Bristol. Will there be further changes in 2018? It’s tough to say – I think that would largely depend on the matchups that ESPN grabs for MNF and whether or not the Disney stakeholders demand more budget cuts from the Worldwide Leader.